This page deals with tengen as the first move. Tengen might have place in other openings as well - for general discussion of tengen role in the opening, see Tengen fuseki. Opening on tengen (or in general any central move) challenges white to a fighting game, indicating a reckless attitude; black is going to play a large-scale game, either using tengen as an anchor point for a grand moyo or to attack: keeping white's groups weak and chasing them to his tengen stone. Using tengen to directly build some center territory is uncommon and can be probably regarded as slow. Another possible strategy is to play mirror go. White can either try to keep the game calm and close by solid plays along the edge, or directly respond to black's challenge, attaching to the tengen stone and starting a large-scale fight. Professional research indicates that fourth-line moves by white in general do not work well against black tengen, since the influence is mitigated by the tengen stone and it is hard for white to set up any larger moyo. We consider mainly tengen played by black here. Tengen as game move is possible as well, but seen even less often; the intentions and continuations are similar, though. See StrangeProOpening3 for an example. a, hoshi (4-4), is pure influence, balancing corner and center influence. b, komoku (3-4), was made in the Kitani Go first game. 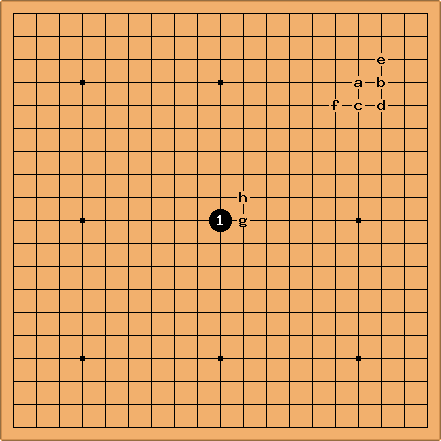 e, 3-3 point, is too early since it gives Black a which coordinates with tengen. g can lead to the Pinwheel. g and h generally lead to an immediate fight in the center; alternatively, the players might first choose to occupy the free corners, and only then attach and start the fight. A model example is the famous game between Tartrate and Redrose.